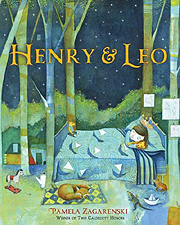 Leo the Lion is a regal companion to Pamela Zagarenski's beautiful book Henry & Leo. His plush body is soft and cuddly, and his mane is topped off with a shiny crown. 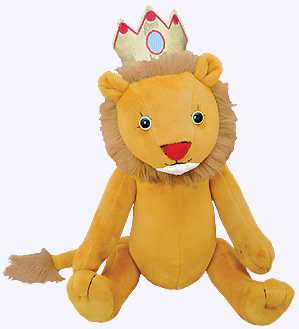 Leo the Lion�s jointed arms and legs increase his play value, and his sweet expression makes him easy to love. Leo the Lion is 15" standing. Safe for all ages. Leo isn�t just a stuffed toy, he is Henry�s best friend and brother. He is as real as a tree, a cloud, the sun, the moon, the stars, and the wind. But when the two are accidentally separated, no one in Henry�s family believes Leo is real enough to find his way home. With beautiful mixed-media paintings, the Caldecott Honor�winning artist Pamela Zagarenski explores the transcendent nature of friendship and love. Hardcover Picture Book. Ages 4 - 7.